Based on a comprehensive understanding of Dr. Maria Montessori's principles and pedagogy, as set forth by AMI (Association Montessori Internationale), Blue Spruce Montessori Children's House believes that providing a nurturing and prepared environment with purposeful, self-directed activities, which support the natural development of the child, aged 2.5 through 6 years old, will enable them to experience the freedom to develop themselves to their fullest potential. Our endeavor is to create a community of children who learn to care peacefully and respectfully for themselves, one another, and the world around them. After completing a variety of Early Childhood Education classes and working in several different Early Childhood programs, in the San Francisco Bay Area, I moved to Colorado. While working as a day camp counselor at a YMCA, I was introduced to the Montessori method of education. It is there that I became a classroom assistant in a one room Montessori school house, for three years. I was immediately in awe of what young children were capable of doing in this truly amazing alternative style of educational environment. Because of my experience, I had a growing desire to deepen my knowledge of Montessori education by taking a teacher training course. Shortly after moving to the Pacific Northwest, I worked as a classroom assistant at a Montessori school in Portland, for 10 years. After receiving my AMI (Association Montessori Internationale) Primary Montessori Diploma in 2011, I worked as a guide (teacher) at a Montessori school in Portland, for 2 years. In 2015, my husband encouraged and inspired me to open Blue Spruce Montessori Children's House. Outside of school hours, I enjoy spending time with my husband and our dog. Some of my other interests include gardening, cooking, hiking, travelling and spending time outdoors. We are located in a quiet community in the Heritage Neighborhood of NE Vancouver. Our lovely classroom space is warm, inviting, filled with natural light, and beautiful Montessori materials. Our space has been thoughtfully and purposefully prepared to meet the developing needs of the children in our care. The children will have access to explore in our charming backyard, which includes a deck, an expansive grassy area, a large planter box garden area, and a variety of plants and trees. Children arrive and are greeted at the classroom door by Ms. Lori, and their classmates. They will independently take care of their belongings/self and enter the classroom space. As needed, the children will be given assistance by Ms. Lori as well as their classmates, to hang up coats and change into indoor shoes. Soon after visiting with their friends and transitioning to school, the children begin individual or small group activities. Once everyone is settled (generally around 8:45), the children work independently or in small groups, in which they receive presentations on various activities including: spoken language, reading, writing, math, and the development and refinement of the senses (through the use of visual, tactile, auditory, etc., sensorial materials). Children also work with various Practical Life activities that include Care of the Environment (sweeping, dusting, arranging flowers, polishing, etc. ), Care of Self (food preparation, and practicing fastening buttons are examples) as well as movement activities (balancing on the line, yoga). Various art media are also available, as well as daily experiences with music (singing, musical instruments). Morning snack is available from 8:30-10:30. Drinking water is available throughout the day for children to serve themselves. At the end of our work cycle, children help to prepare our space for lunchtime by straightening up our room and setting tables for lunch. Children eat lunch, practicing various skills associated with meals, including serving themselves an appropriate amount of food, pouring a beverage, cleaning up one's space, and practicing appropriate table manners such as keeping one's napkin on one's lap, using a utensil, speaking with an empty mouth, etc. Ms. Lori will facilitate conversation at the table. We work and play on the deck and in the backyard, experiencing all types of weather. Half day children depart at 12:30. Children who rest, will transition to napping space in the classroom. Children who do not sleep will join the afternoon Montessori work cycle. Children will work individually or in small groups and receive presentations, as in the morning work cycle. Afternoon snack is available from 1:00-3:00. Children help prepare their classroom space for the next school day. 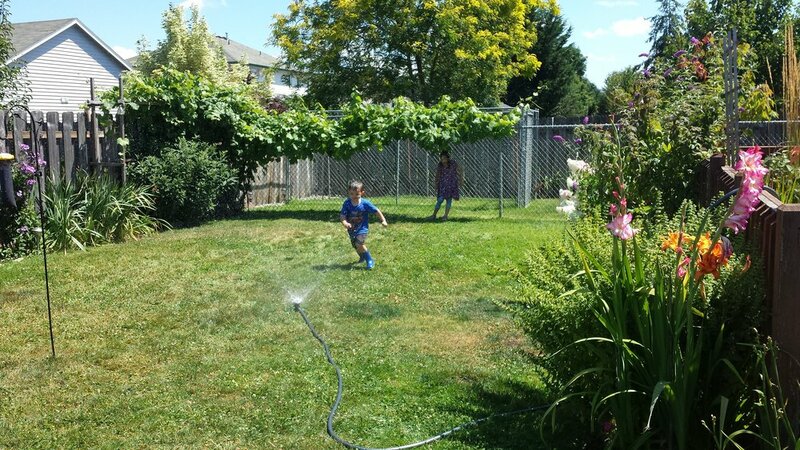 As weather permits, children play in the backyard while awaiting pick-up. School is over and we say good-bye until next time.